A few years ago, tzatziki was all I could think about. These days I’ve moved on to yogurt salad. The influx of Mediterranean and middle eastern restaurants in Bay Ridge has certainly contributed to the habit. Finding a lack of “tzatziki” listed on the menu I was driven to enjoy my pita with other yogurt dips like haydari and yogurt salad. In honestly, I think haydari might be my new favorite, but I haven’t yet perfected the home recipe. In the meantime, yogurt salad is a perfectly satisfying replacement. There’s minor differences between yogurt salad and tzatziki. 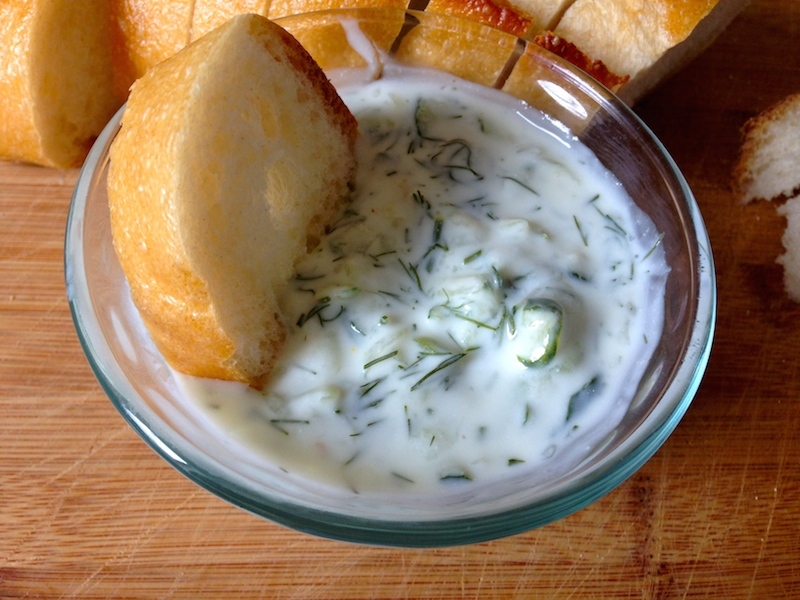 Tzatziki has a thicker base from either greek or strained yogurt. The cucumber is shredded thinner and all the flavors are there but the result is a thick, smoother dip. On the other hand, yogurt salad is made from regular plain yogurt, diced or coarsely shredded cucumber and spices. The result is a thinner, almost soupy dip. Rather than dipping your pita or bread, it requires more of a scooping action and while not suitable for topping turkey burgers, I’d a refreshing blend of cool yogurt with lots of cucumber chunk flavor. Squeeze any extra water from the cucumber as you transfer it to a medium mixing bowl. Sprinkle with sea salt. Add dill, mint and garlic powder. Stir in yogurt, lemon juice and olive oil. Don’t worry, the dip will be a little soupy. Season with additional salt if needed and chill for at least 30 minutes before serving with pita corners, crusty bread or tortilla chips. Really a cool yogurt salad, can I add some finely chopped tomatoes to it? Absolutely. I’m not sure it would keep as long in the fridge though. I usually make a huge batch that lasts 4-5 days. With the tomatoes and their juices maybe only 2 days? Yeah, or I will be adding tomatoes just before I serve. Isn’t it? Yep one of my favorites. Love this, I have to look up haydari never heard of it but if it involves yogurt I would like it I’m sure. Haydari is really thick, almost like a yogurt cheese. It skips the cucumbers and integrates garlic, olive oil and walnuts I believe. I love this combo! I’d love to try it myself. This sounds so fresh and tangy! It really is delicious and the perfect summer treat!